Visualize your data from CallTrackingMetrics along with data from other platforms. Use our software to gather data from your conversations, then use Google Data Studio to merge it with your data from other platforms for a holistic view of your performance. Now, CallTrackingMetrics connects with Google Data Studio, so you can easily merge and compare your valuable call data with the information pulled from platforms like Google Analytics and Salesforce. 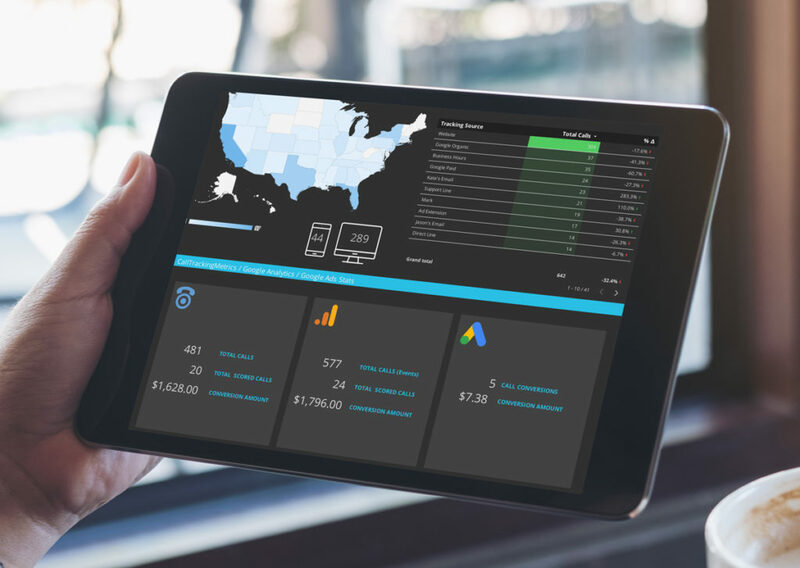 Use Google Data Studio to create interactive dashboards that can be viewed and edited by anyone of your choosing, then populate your shared dashboard with data imported from spreadsheets or a myriad of connected platforms. Your dashboard can be shared with colleagues, or exported into an easily accessible report. Users of all experience levels and those with different requirements can easily take advantage of this integration, thanks to the two levels of complexity we’ve built into our Google Data Studio Connector. With the Activity Reports Connector, you’ll notice your existing CallTrackingMetrics Activity Reports are quickly and easily imported into Google Data Studio. This will display only the dimensions you’ve already chosen to measure and report on. If you’d like to further customize your reports, set up our Call Log Connector. This will gather all the raw data from your CallTrackingMetrics call log, using nearly all fields as possible metrics to measure and report on. Then, you can use Google Data Studio to arrange that raw data into the perfect set of visualizations and graphs. With Google Data Studio, you can transform that inbox full of reports into a single interactive dashboard which displays your information in real-time. Now, data from your CallTrackingMetrics account can be compared, filtered, and organized by anyone that you allow access. Imagine the power of viewing all of your information, from multiple sources, in a single screen! This integration is available to all CallTrackingMetrics users on any plan level. It also requires an account with Google Data Studio. If you meet these requirements, you can learn how to set up the Google Data Studio integration here. Wondering if our integration with Google Data Studio could benefit your organization? Contact us today to speak with a member of our team, and learn more.